Welcome to Travel Estravaganza Online! Congratulations on receiving your Travel Extravaganza! Prepare yourself for a cornucopia of exciting travel offers. Just activate your Promo Code and you will be eligible to receive the greatest selection of travel offers ever assembled in one program. Click on the Activate Button and you will be taken to our activation site. Once activated, you will be eligible to pick from any of the 14 fantastic travel offers and start planning your next vacation right away! Here's how it works... As Easy as 1. 2. 3. Activate your Travel Extravaganza Promo code online: Click Here to Activate. A $4.95 activation fee is required. All funds must be in U.S. dollars. Once your Promo Code is activated you will receive via United States Postal Service a travel certificate request form where you can request the travel offer of your choice. Book the Travel Certificate you requested and go on your trip! Along with your travel certificate, you will recieve another travel certificate request form to use to request your next travel offer. Continue to submit as many requests as you like until you have used all the coupons in the book. There is no time limit on this offer. 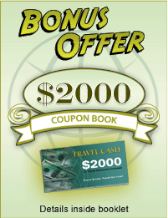 Offer your customers the most powerful travel incentive ever offered. Travel Extravaganza is 14 fantastic travel offers that never expire and are backed by a licensed and bonded travel agency. Featuring The Worlds Greatest Travel Offers!